My Opinion: 8.4 || An enthralling intellectual treat that also manages to be emotionally vital. Very few movies achieve this level of stimulation, and Juliette Binoche is an enthralling, trilingual knockout. Unfortunately, although the film plays a delightful game through the first half, it loses steam once the game is up. SYNOPSIS (Courtesy of Netflix): In Iranian director Abbas Kiarostami’s captivating meditation on art and love, British writer James Miller (William Shimell) meets a beautiful gallery owner (Juliette Binoche) in Tuscany and begins — or possibly continues — a romance with her. Strengths: This is Abbas Kiarostami’s first film outside of Iran, and he certainly doesn’t play it safe. The core story couldn’t be more simple, but it’s packaged inside of a sly puzzle that keeps us guessing about the nature of the characters’ relationship. The movie is filled with fascinating moments, and Binoche is so edgily captivating that we hang on her every word. With its ambling, walk-and-talk structure, the film strongly resembles Richard Linklater’s Before Sunrise movies. And its very facile trickery echoes Kiarostami’s wonderful Close Up. In that film, Kiarostami gleefully flouts the boundary between reality and fiction, leaving the audience to make sense of the underlying reality. 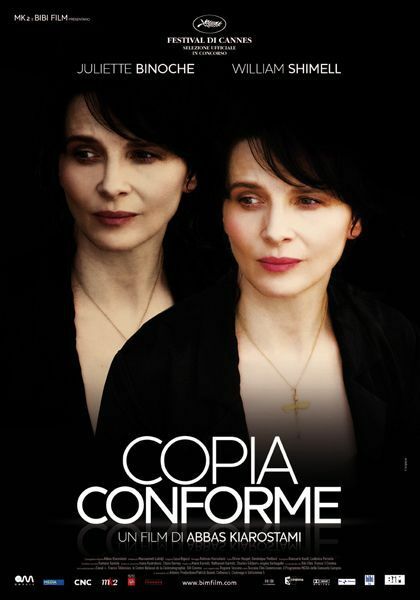 At its best, Certified Copy is just as audacious and absorbing. Weaknesses: Kiarostami keeps the first half of the film vigorously alive by dangling possible interpretations of the Elle-James relationship. Their connection is like a quantum wave: full of energy but with no fixed position. Eventually, though, those tantalizing potentials collapse into a less intriguing fixed reality. The movie continues to be absorbing — largely thanks to Binoche — but its intellectual frisson recedes. And . . . as much as I love the puzzle of the first half, I can’t quite square it with the reality that gets established. Essentially, though I hate to say it, Kiarostami cheats a little at the outset, having Elle and James say and do things that don’t make sense in the context of their relationship as we come to understand it. Characters/Performances: The few secondary characters are all very good, especially an Italian café owner whose dialogue with Elle is one of the film’s highlights. Kiarostami likes casting nonprofessional actors, which can be a great technique, especially when they’re being asked to play versions of themselves (as in Close Up). It’s much riskier, though, when you’re looking for dramatic range, and that becomes a problem with William Shimmel as James. He’s wonderful at the outset when his job is to be urbanely charming and vaguely aloof. Later, however, when Kiarostami needs him to emote believably, the performance is badly strained. Juliette Binoche is another story. I’ve loved her many times, particularly in The Unbearable Lightness of Being, The Widow of Saint Pierre, and Three Colors: Blue. (Chocolat evaporated from my neurons about five minutes after it ended.) But this exceeds anything I’ve seen from her — easily one of the best performances I’ve seen over the 92 (so far) films of this project. It’s a supple, verbally electric tour de force in English, Italian, and French, and she’s never looked more vibrant. Best Moment: One brief scene that illustrates Kiarostami’s playful inventiveness: He presents a testy exchange between a man and his wife, then shifts perspective to invert our understanding of the conversation. It’s a small moment that made me smile with the delight of having been gently tricked.